In Hawaiian, Hololani means “Gone to Heaven” which is exactly where you feel in this premiere West Maui Vacation Rental. Whether sitting on your large private lanai, walking along the white sandy beach or snorkeling with the tropical reef fish just outside your condo – you will know you are in a heavenly paradise. This Maui beachfront resort is an excellent family get-a-way with spacious ocean front two bedroom condos. A short stroll brings you to some of the islands best restaurants and shops at the Kahana Gateway Center and a quick hop in the car will have you arrive at premiere golf courses and surf spots as well as the famous old Lahaina Town and Harbor. This second floor condo in Kahana is right on the beach and has spectacular views and has a television in the guest bedroom. The guest bedroom which is ocean front is separated from the living room by a pocket door. Both bathrooms feature large tiled walk-in showers- no tubs. Bring your laptop with wireless card to access the free property wide internet. Assigned parking for your convenience. th Floor 2 bedroom condo with direct Ocean Front view in Kahana. Master bedroom features a new king size bed with ocean front views and access to the lanai. Guest bedroom features a comfy queen size bed. Both bathrooms feature tiled, walk-in showers. With fully equipped kitchen, granite counter tops, upgraded bathrooms, and TV/cable and free Wi-Fi. This unit has everything you need for a comfortable and memorable vacation. The ocean view lanai has furniture enough to accommodate 5 with a beautiful view of the ocean sunsets. No A/C however; we get nice trade winds throughout. The large bedrooms are comfortable and quiet for a good night sleep. Assigned parking stall for your convenience. Ocean front penthouse location with 2 bedrooms on the beach in Kahana. NEW as of July '14: Living room furniture, 47" Flat screen TV and BluRay DVD player, King bed + furniture in guest bedroom 2 with new flat screen TV and lounger on lanai. The ocean front bedroom is separated from the living room by Shoji screens. Be entertained in the evenings with TV's in Living room and both bedrooms. 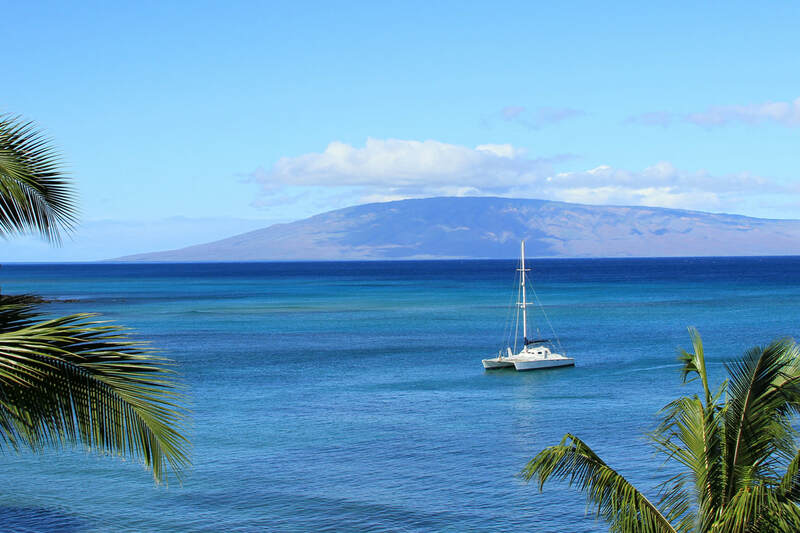 The double long lanai is perfect for sunsets and whale watching. Assigned parking space for your convenience.